Mies van der Rohe's seminal Barcelona Pavilion is set to undergo another radical change – Spanish architect Luis Martínez Santa-María plans to erect huge columns made from old steel drums in front of it. Santa-María will use recycled steel drums, previously used for storing waste chemicals, to build 10 columns outside the iconic pavilion, which was first constructed in 1929, dismantled in 1930, then rebuilt in the 1980s. Matching in height and spaced out evenly across the site, these colourful structures will tower above the building like totem poles, obscuring the view of it from the plaza in front. The architect describes the additions as both "column tambours" and "objets d'art". "Time has undertaken to strip them of their paint and disfigure them, to deactivate their functionalism, thereby obtaining inimitable effects on their surfaces and in their dents," he said. Ludwig Mies van der Rohe originally designed the pavilion to represent Germany in the Barcelona Expo of 1929. Since being re-erected, it has been used to host a number of installations. SANAA added acrylic curtains to the space in 2008, and the following year Ai Weiwei filled its pools with coffee and milk. More recently, Andrés Jaque furnished the building with junk from its basement. Santa-María's proposal responds to a brief set by the Fundació Mies van der Rohe, the nonprofit organisation that manages the building. Entitled Fear of Columns, it called for a recreation of Les Quatre Columnes, the four Ionic columns created by Catalonian architect Josep Puig i Cadafalch in 1919 but demolished just before the Barcelona Expo along with other Catalan monuments. The installation will bear the name: "I don't want to change the world. I only want to express it." 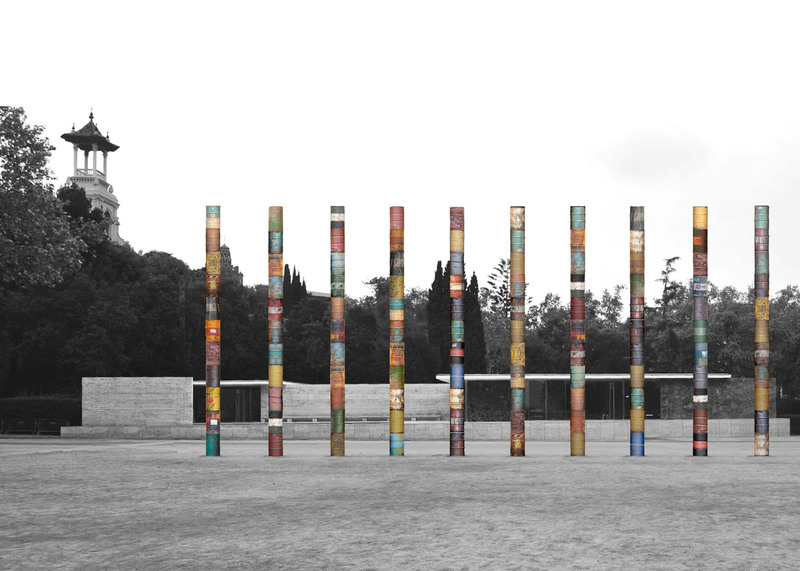 "The multicoloured row of columns made of cast-away industrial drums also establishes an ironical relationship between the threats of the industrial landscape and the ambiguous, misguided beauty it reveals," said Santa-María. "Perhaps this would have pleased Mies, who once said: 'I don't want to change the world. I only want to express it'." Santa-María was selected from a shortlist of 26 architects, designers and artists. His installation will be unveiled on 1 June 2016, coinciding with the 30th anniversary of the pavilion's reconstruction, and will remain in place for five months. Mies van der Rohe died in 1969, aged 83. He completed the Barcelona Pavilion in the early years of his career, before emigrating to the United States, where he went on to complete buildings including the Illinois Institute of Technology, Farnsworth House and the Seagram Building.